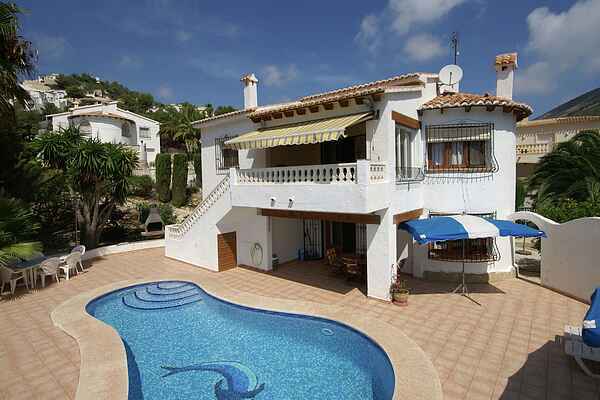 This lovely, comfortable villa has two levels, each with its own entrance, but rented out as a whole. The tasteful, upstairs living room has a comfortable lounge area with doors opening out onto a terrace with a beautiful view over the local surroundings and of the distant ocean. The bathroom and the kitchen, with built-in bar, have all the amenities you could ask for and are a great place to start enjoying your holiday. The downstairs also has a charming living room with a lounge area and its own terrace. There is on-site parking. Located on a hillside in the peaceful villa district of Verdes Pinos, this lovely detached villa is surrounded by a gorgeous, carefully-maintained garden. The large, fully-enclosed garden is quite a sight to be seen. Palms of all shapes and sizes are flanked by pine trees, oleander, and bougainvillea in stunning pink and purple shades. In the centre of all of this beauty is a sun terrace with lounge chairs, outdoor shower, and an elegant, kidney-shaped private pool. The stone BBQ is ready and waiting for you to use it. Enjoy! You might also enjoy a day trip to the beach, and you're in luck with El Portet being just 2.5 km away. Here you will find a child-friendly beach, as well as a number of restaurants and outdoor cafes. There is a supermarket just 1.5 km away and the centre of Moraira, a bit farther, is 3 km away.